Audrey Steiner and Corey Williams are processed on the grounds of the Texas State Capitol after being arrested for chalking a public sidewalk nearby (photo: Kit O'Connell, all rights reserved). I know this is a question we ask frequently on these pages. Every day some new offense against basic freedoms comes to light, further shaking faith in the basic principles of our constitution. I thought I was jaded, but what happened in Austin last Thursday shook me — not just because chalk merits police response, but because of the intensity and overwhelming force being used to strike at one of the simplest, most transient forms of expression possible. 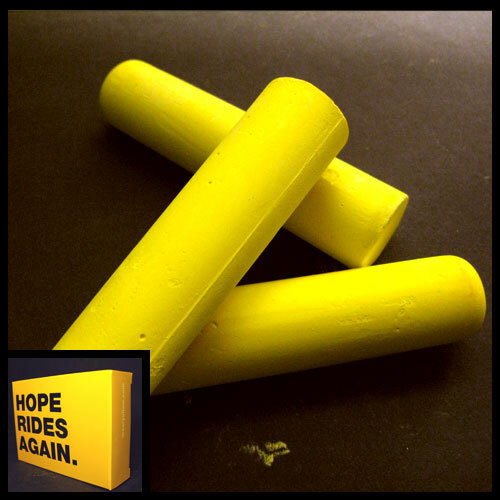 By now most of us have heard of the crack down on chalk which occurred in Los Angeles in July, when Occupy Los Angeles passed out chalk to a monthly Artwalk event and the gathering found itself under attack by violent riot police retaliation. Activists decided to pass out chalk at the Artwalk in the first place because of almost two dozen arrests for chalk in public places just in Los Angeles. Not a single one of these arrests has resulted in charges. 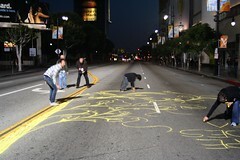 Participants of Occupy LA’s Chalk Walk wonder why the Los Angeles Police Department continues to arrest them for chalking when the City Attorney has declined to prosecute any of the chalking arrests. Occupy activists say that LAPD had made nearly twenty arrests for chalking related to Occupy but has failed to make chalking arrests at non-occupy events including an event the Mayor handed out boxes of yellow chalk to be used on the “sidewalks,driveways, and any blank canvasses” including the streets of Sunset Blvd in traffic at night for a fundraiser for Lance Armstrong’s art campaign, “Hope Rides Again”, sponsored by Nike. I know this is a question we ask frequently on these pages. Every day, some new offense against basic freedoms comes to light, further shaking faith in the basic principles of our constitution. I thought I was jaded, but what happened in Austin last Thursday shook me — not just because chalk merits police response, but because of the intensity and overwhelming force being used to strike at one of the simplest, most transient forms of expression possible. The crack down is not limited to Los Angeles, but appears to be occurring nationwide. Activists in Orlando recently won a lucrative lawsuit against the city for wrongful arrest in a chalk-related arrest of an Occupy Orlando member. Occupy New Orleans members fled from police during their chalkupy event. While the crackdown may be political in nature, not just activists are getting caught up in it — a mother in Richmond, Virginia faces 50 hours community service because her daughter chalked some rocks, and two teens in a Philadelphia suburb were ticketed for drawing a sea turtle and a whale in chalk. Which brings us to Austin, where two people were arrested Thursday and face uncertain charges for expressing their right to free speech.